Fleas plague the homes of many pet owners here in Pretoria. Pet owners or even people with Rat Infestations are constantly on the fight against Cat and Dog Fleas. Flea Control Pretoria is just another service Pretoria Pest Control has on our books. Bats, Cats, Dogs and Rats are only but some of the hosts Fleas like to live on. Warm Blooded mammals are the order of the day. Fleas are a pest and for any level of successful treatment an integrative approach for control has to be adopted. Pretoria Pest Control have the means and knowledge to implement successful Flea Control every time. Flea Control Pretoria deal with Fleas by adopting a unique approach. 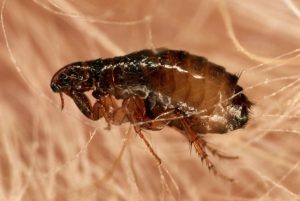 Fleas are for most part a formidable Pest, their lengthy stay of up to 18months in their egg state can be problematic to some. Our Flea Experts use a longer lasting residual insecticide that clings to fibers and eradicates newly hatching fleas months after we leave. This leaves you protected long after our treatment. The chemicals we use are safer and low-odor, they dry clear and leave no smell or staining. When it comes to Flea Control Pretoria, we are a cut above the rest. Pretoria Pest Control guarantees results by treating all our clients and their infestations uniquely. For instance, if you have an above average Flea Infestation, we will treat your problem. Make recommendations regarding environment factors that allow Fleas to thrive and further apply an Insect Growth Inhibitor that prevents them from reproducing. This guarantees results regardless of your situation. Flea bites are common around ankles and your waist area. This is generally the first place Flea bites occur. The name suggests these insects only live and feed on cats. This is far from the truth, Cat Fleas are the more common species found here in Pretoria. They frequent domesticated animals, birds, rodents and even bats in rare cases. Some Fleas are even known to spread disease such as the Black Plague. Dogs are common Hosts for species of Flea. Dog Fleas are less common than their counterpart. They are smaller but this does not mean they pack less of a punch. They live on similar hosts and look similar, they also carry diseases such as Lyme Disease, Tape Worms and Typhus. In Pretoria successful Flea Control for any species of Flea is possible. Flea Control Pretoria starts with a single call to Pretoria Pest Control. Call us for a free and no obligation quotation. 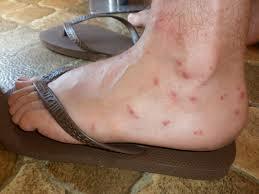 Let the Flea Control Pretoria guys take care of you biting insects, fast and effectively. Staff are friendly and always willing to help. We are full of industry hints and tips on all aspects of structural Pest Control. 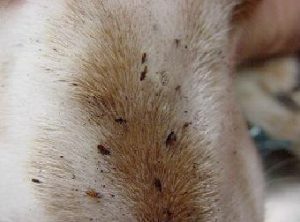 Biting Insects affect the life’s of so many people here in Pretoria, weather you are getting eaten by Fleas on your dogs or Bed Bugs brought back from your last trip overseas. Biting Insect Control Pretoria have your solution. By having our professional exterminators apply leading chemical technology to key areas, your Biting Insect infestation will be a thing of the past. When is comes to Biting Insect Control Pretoria, look no further. Pretoria Pest Control has you covered. Our team of Pest Extermination Specialists identify you Biting Insect Problem and treat it accordingly. By using the least toxic effective option first, our treatments are safer and odorless. Targeted pest treatments are the way forward and all our Pretoria staff use them as first option. Commonly found in the homes of animal lovers as well as homes that have been empty for years. Fleas are a ferocious ambush Insect, they have the ability to jump more than 300x their height. The lifespan of their eggs are approximately 18 months, this makes Flea treatments more difficult than conventional Biting Insects such as Bed Bugs or Bird Mites. Pretoria has large residential areas filled with pet owners, this makes the work of our Biting Insect Control Pretoria a never ending loop of treatments. Bed Bugs pose a problem in our informal settlements just as much as our middle class residential areas. These vampire like Biting Insects attach at night and flee by day. They are light sensitive and hide in the deep dark areas of your room. 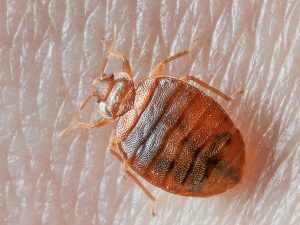 Bed Bugs (Cimex lectularius) may seem like Insects of myth, this is far from the truth. They are real and some may be rather large. Given that they hide so well, Bed Bug treatments here in Pretoria could be tricky for the less experienced Pest Controller. The Biting Insect Control Pretoria team of exterminators kill them with no mess and no fuss. Birds Mites are mostly a seasonal Pest. Starlings that nest in your roof leave Mites behind after they have left. Our Biting Insect Control Pretoria Team deal with these pests once and for all. Similar to Fleas, Ticks are ambush insects. They wait on the tip of grass and shrubs attaching them self to unsuspecting prey that passes by. Tick carry diseased that are blood borne and can be transferred with a single bite. Pretoria looses animals on a daily basis because of Tick bites. Biting Insect Control Pretoria deal with these nasty insect once and for all ensuring the safety of your loved ones and Pets. The list of services that Pest Control Pretoria has to offer is longer than we let on. Witch ever Pest you may be facing don’t hesitate to give us a call. Our specialist teams can help you with any and all pest related problems. Any rodents or Insects taken care of in a jiffy. Biting Insect Control Pretoria is only the tip of your service iceberg.